Ready for some excitement in the high sierras and desert sun? Discover white water rafting Lake Tahoe, Truckee River and surrounding areas of Reno. Tahoe Whitewater Tours has a trip for everyone. You can search for a rafting trip by class (relaxing, intermediate, advanced), location (Truckee River, American River, or Carson River), and length of trip. They have something ranging from 1/2 day to 3 days! Tributary Whitewater Tours have been safely guiding California whitewater rafting and American River rafting trips since 1978 and offer something for all levels, from Mild to Wild. They have packages great for kids and family vacations in addition to extreme whitewater rafting adventures for the expert. The IRIE (Isolated Rivers Incredible Experiences) offers a half-day trip from Bocca to Floriston twice daily. This trip includes some Class III rapids like Jaws and Bronco Rapids. Visit their site to book your experience today. 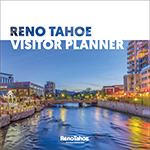 Discover a whitewater thrill on the Truckee River along with the excitement of rafting in the heart of Reno. Join Sierra Adventures for whitewater rafting on the scenic and challenging Truckee River. Their trips take you through some of the most scenic stretches of the Truckee. Bring the whole family or your favorite group of thrill-seeking friends for some major rafting fun. Looking to check out Reno whitewater rafting and kayaking in action? Check out the Reno River Festival!